Finding David Douglas is outstanding! Congratulations on a beautiful and educational production. The music is lovely and very appropriate. The graphics are superb. In all, I would say this will become a classic of Northwestern biographical material. All the sweeping landscapes that David Douglas saw, and the rich accents of the people he traveled with, come alive in this beautiful film. You did it! A triumph! Very well done. Syd’s song - collecting the seeds for your garden! - is so perfect. Students of all ages can travel in David Douglas’s footsteps – often to the exact locations he wrote about in his famous journals. This beautiful film weaves art, music, and history with Douglas’s own words and observations into an inspirational story of adventure, hardship and scientific discovery. Finding David Douglas is a remarkable resource for educators. David Douglas was a major contributor to forestry in the British Isles through his tree introductions, particularly Sitka spruce which is now the backbone of our domestic forestry industry. 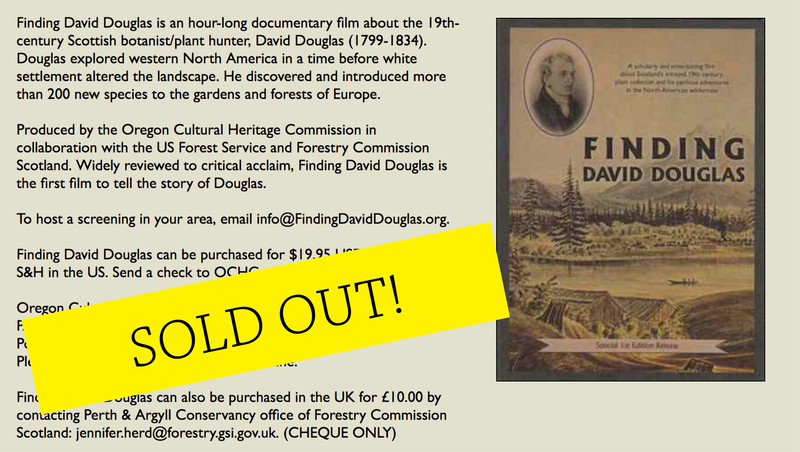 Finding David Douglas commendably captures his trials and tribulations as well as his successes, and I commend anyone with an interest in trees, forestry and adventure to view this entertaining [film]. You will then appreciate that Douglas has probably had more influence on the shape of our countryside today than any other single individual given the huge use made of trees he introduced in creating our modern forest resource. It is a fitting tribute to one of Britain’s greatest plant hunters and travellers in the then relatively unexplained regions of North America. The documentary captures well the size and the wildness of the northwest territory as Douglas would have seen it and given the absence of Douglas’s second journal the commentary conveys a well balanced account of his travels throughout.